We've decided to tackle replacing the isinglass on the flybridge ourselves. We've watched numerous videos on You Tube and the sailrite site. My wife is a quilter and more than knows her way around a sewing machine. We plan on buying a sailrite sewing machine. We'll be replacing the isinglass on the existing panels and zippers. Coated, clear vinyl sheets (Strataglass; O'Sea)? Our current setup on the bridge has three panels forward. We roll the middle panel up. We never roll the two forward panels on the sides. Our side panels have smiles. We frequently roll up the smiles, we never rollup the side panels themselves. We roll up the entire back. Any thoughts or feedback would be greatly appreciated. I would not use sheet vinyl again. Lexan type polycarbonate is so much better and lasts many time longer. Not a DIY job though. Instead of rolling you swing it up. Corner frames can be eliminated by curving 30 mil lexan. Many thanks, I appreciate your feedback. For the side windshields, I can go a bit softer, but still want very clear views. I'm thinking 30 gauge O'Sea. I have fabricated enclosures for about 6 of our boats. The best is Strataglass. However it is expensive and one fabricator said he does not use it in cold climates. For our current boat we used 30 gauge Regalite. It was easy to work with. So far so good as to durability. It is 2 years old now so maybe too early to really tell. For our current boat we had the front 7 panels fabricated for us out of EZ2CY panels. We made patterns for the fabricator that is in NJ. He made the panels and shipped them to us. Fit perfectly. 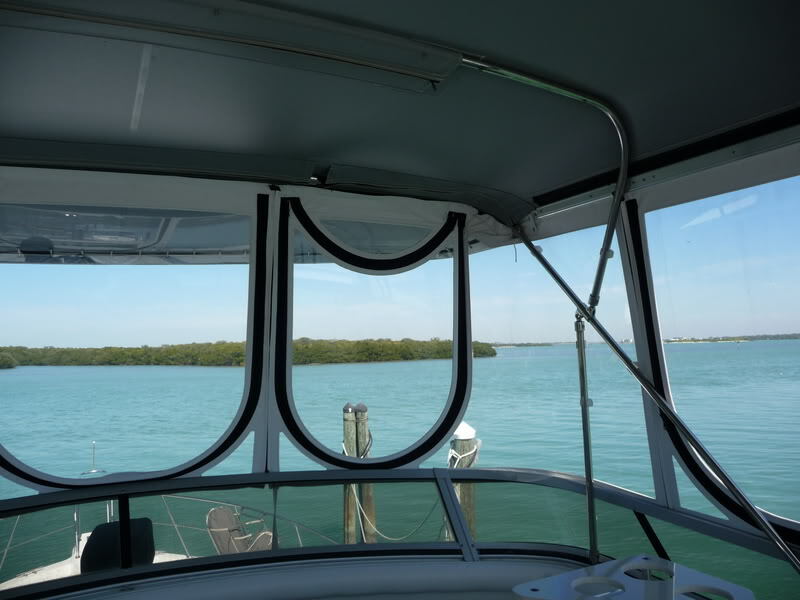 We did the rest of the flybridge enclosure and the enclosure for the sundeck. Our boat is stored indoors for half the year so the enclosure should last a long time. As to thread, only use Tenara or similar thread. It will last forever (almost). It is more expensive to buy but it is a false economy to use poly thread. When you buy the Sailrite machine have them set it up for Tenara since it is more difficult to set the machine properly. One setup properly don’t change the machine. Only Tenara goes through my machine. My $0.02... I have done many vinyl panel repairs for myself and others as a hobby business. Sailrite machine works fine and what I have. Advise getting the monster wheel mode- slows it down but adds control and power... like a low gear. From bc back side cut the outer row of stitch and cut the vinyl close to the inner stitch. Sew a new vinyl panel (slightly larger than origin if necessary and bc stitch it in using just the outer stitch line. Stitch the 2nd / inner row of new panel close to the edge of canvas like the old one. A lot neater, no ragged edge to catch more water as n leather or dirt. Looks more professional. It were I'll take more time but if DIY take the time and do a better job. I wrote Sailrite and suggested above as an option and they seemed to like the idea said they would add it when updating some videos. I have used 40 mil roll but prefer Stratoglas. IRS better visual quality and if it needs replzcingcand you can DIY $ of new material is reasonable vs having someone else do sheet matl. If getting started w DIY Canvas look for the DIY Canvas Tips Thread in Gen Maint section. My Bacchus website in sig has a page of getting started tips I put together for a local seminar. Let me know if you have ? Happy to help. It's not rocket science or brain surgery just takes practice and the right attitude. Crusty & ksanders 2 that come to mind immediately that have done some very nice work. Also Rockford Supply a good source for matl & supplies. Prices a little better than SRite and they have some good buys on 2nd & close out matls... good especially for practice projects. Check SailRite for machine special $. Thry frequently do free ship around boat show times. We're talking Gauge not Mil. 30 gauge should be Thicker than 40 gauge. Gauge should be a fraction of an inch. Therefore 30 gauge (1/30 of an inch) should be thicker than 40 gauge (1/40 of an inch). 40 Ga Stratoglas spec lists 0.040" Thk and that's what I've miced it as. Ive used 0.030 for small fishing boat side curtains where rolling small & storage more important than visual but I wouldn't use less than 0.040 for anything else. It is usually referred to as gauge. But 30 gauge is .030 inch or 30 mils. 40 gauge is thicker than 30 gauge. Our front three panels are Makrolon, whatever was their normal product in 2007. The center panel fold up (on the fabric) and we snap it to the underside of the hardtop. The rest is all Regalite, .040" I think, also installed in 2007... all with roll-up "smilies." The front 5 sections have been in place 24/7/365 since 2007... and this year we're just now needing to replace those Makrolon panels (due to clouding) and one of the Regalite roll-ups due to a tear. I reckon we got our money's worth. The fabricator tells me there's a newer/better (likely more expensive Makrolon for marine use). The 5 aft Regalite sections (ditto from 2007) are only installed during colder months, approx October through May, otherwise rolled and stored. Those are wearing better, but there are some scratches here and there from rolling.